Thanks to a confection-making class at Theo Chocolate, Dave & I are now capable of making ganache, tempering chocolate, and making mendiants! Yum! Our teacher was the head of the confection-making department at Theo. She took the 9 of us in the class down to the kitchen (which smells amazing!) for class. We worked in pairs for about 3 hours making our delicious candies. First we mixed up some ganache and piped it out into kiss shapes. 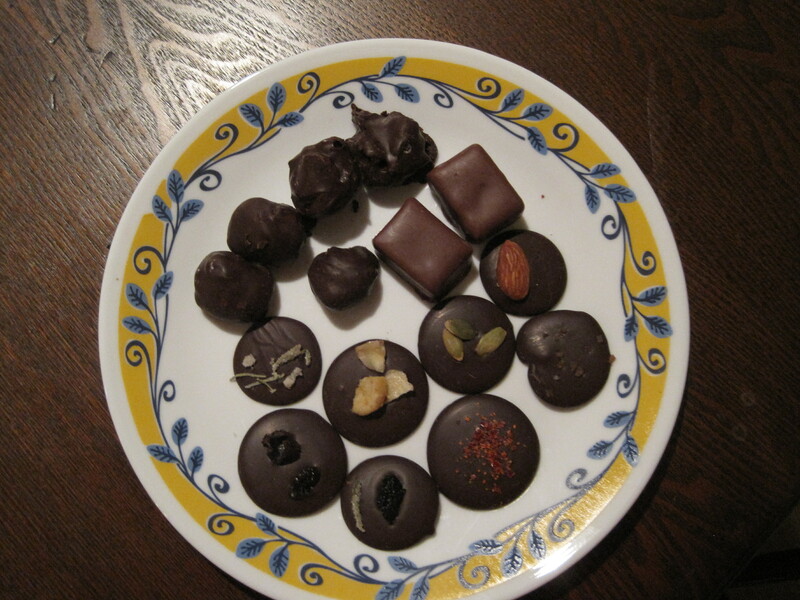 Those went into the refrigerator to set while we watched the instructor temper milk chocolate on a granite tabletop. We dipped some peanut butter pralines into the milk chocolate (those are the rectangular shapes in the picture). After that, we learned to make our own piping bags out of paper and then used them to make mendiants. Of everything we learned that day, we excelled at the mendiants. We were the only pair that didn’t end up with chocolate-covered hands after piping them onto the tray. Also, our instructor remarked that we were “so fast” and that our mendiants looked perfect. After the mendiants, we tempered our own chocolate over a stove and rolled our ganache kisses to get them ready for dipping. Admittedly, our truffles are ugly. They taste great, though, and we have plenty of time to practice our truffle-making skills! how cool! Looks like you need a lot more practice though. you probablly need to make dozens and dozens. Shall I give you my home address for the extras? Emily, the truffles are GORGEOUS and you guys rock for being the stars of the class. What a fun date!